I get so excited when other educators share their learning experiences on @desmos with me via @MtBos or other blogs! It motivates me, excites me, and the first thing I want to do is suss it out myself! Here is one construction I created in response to a calendar problem solution posted in NCTM Mathematics Teacher (vol.110, Number 1, August 2016) presented by Scott Smith in the Reader Reflections I loved the solution so much that I immediately wanted to re-create it in Desmos! Inscribing a regular hexagon into a unit circle. When I play/create/explore/learn using Desmos, I have to think not only from the perspective of myself as the learner, but also myself as the teacher of my Year 9 students who will be the learners. What might my students be challenged by in this activity? What questions might they ask when stumped? How might this activity extend their thinking? How do I graph a unit circle ? How might I locate the vertices of the hexagon as coordinates on the circle? Should I use Cartesian or polar coordinates? What are polar coordinates? Do I know about them to use them? Can I use Pythagoras or trigonometry to find the coordinates of the six points? How can I find the coordinates using function notation? How can I represent my circle as a function? How can I use the point coordinates that I have graphed to draw a line? How can I transform the lines that I draw using the point gradient formula? How can I change the intervals for which the edges of my hexagon are graphed? 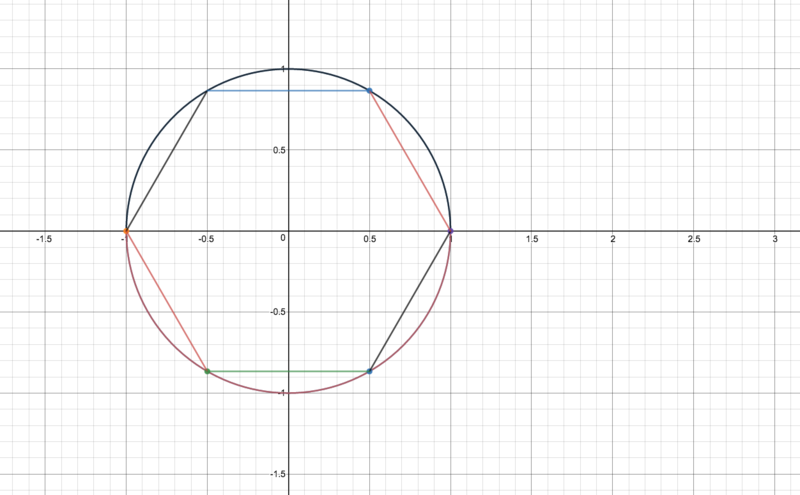 This simple geometric construction, and all of the thinking (as a year 9 student) took me about 1 hour to construct. And the learning I did was phenomenal! I started with something simple, started asking questions, explored, realised I did not have enough knowledge, when back to the knowledge I have, then practiced and applied the learning I have done over the past few years using basic functions and simple coordinate geometry! After thoughts - could I have done this as a simple compass and straight edge exercise - how? How might you use a simple construction activity like this one to teach other topics? How many different ways are there to inscribe a hexagon into a unit circle? I would love to know your thoughts and ideas - share your experiences in the comments section. This activity really excited me as a teacher - and I believe it will excite my students as well. Can’t wait to use it! I would love your feedback! Establishing collaborative conversations can only make us better together!